To gain the upper hand in conflict the ability to know what your enemy is planning is vital. Massive amounts of money have been spent and many lives have been lost in pursuit of this objective. From biblical times to the present day, leaders have employed espionage on and off the battlefield in the quest for victory. Tactics might differ, from dirty tricks and theft to interrogation and torture, but the aim is the same - to outmaneuver your enemy and emerge triumphant. 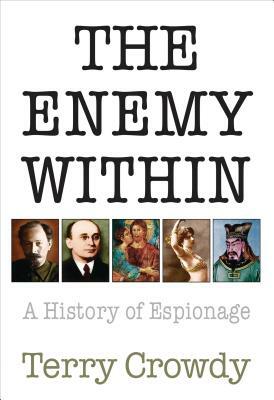 Separating myth from reality, Terry Crowdy traces the history of espionage from its development in ancient times through to the end of the Cold War and into the 21st century, shedding light on the clandestine activities that have so often tipped the balance in times of war. His lively narrative delves into the murky depths of the realm of the spymasters and their spies, revealing many amazing, and often bizarre stories, along the way. From "the slave with the tattoed head" in Ancient Greece, through the ship's monkey hanged as a spy during the Napoleonic wars to the British "Double Cross" ruse in World War II, and from Ivan the Terrible's forming of the first Russian secret police in the 16th century through sexual wiles of Mata Hari to operations in the 21st century Middle East, this entertaining true history of espionage is as exciting as any spy fiction. Chapter Heads - In ancient times. Through dark ages. Spy, Britannia Espionage in the Age of Reason. Vive la revolution Napoleon's 'secret part'. Uncivil war. The godfather of secret service. Spy fever. Double-cross agents and radio games. Axis spies against America. Spies of the Soviet era. With no end in sight. "Crowdy's effective, readable summary of espionage in human history begins with the ancient Egyptians and doesn't end even with the Mossad. Throughout history, a broad range of not only governments but also people have used various means to learn about their enemies and, not infrequently, their friends. Although the senses of humans on the ground have always been highly valued, technology, including invisible inks and coding devices, also has a long history in spying. Women have figured prominently as spies (e.g., Delilah catching Samson in an early "honey trap" of sexual favors) and spymasters (e.g., Roman empress Theodora discouraging gossip about her colorful past). The growth of surveillance technology from miniature cameras to wiretaps and satellites has left the purely human instruments of intelligence gathering at a disadvantage in fights for appropriations and publicity, a situation that Crowdy deplores: "A spy is like a traveling salesman"--he has to "know the territory." Readers of this book will know it, too, much better than they did before." Booklist. Terry Crowdy has a life long passion for history which was first kindled working on the Fort Amhurst restoration project in the Medway Towns, where he spent his school summers as a fortress tunnel guide. Through this association he developed a passionate interest in the Napoleonic Wars and participated in many of the bicentennial celebrations marking the wars of the French Revolution. His enthusiasm led to significant research in the French military archives at the Chateau de Vincennes near Paris. Terry is equally passionate about the history of 'Secret War' - in particular military espionage - a subject he feels is too often overlooked. After a long stint as bass guitarist for the rock group "Soma," Terry put pen to paper and is now the author of a number of books and articles. The author lives in Kent, UK.